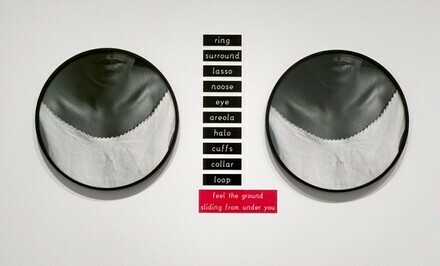 Lorna Simpson; NGA purchase, 2005. Lorna Simpson, The Museum of Contemporary Art, Los Angeles, Los Angeles; Miami Art Museum; Whitney Museum of American Art, New York, 2006 - 2007, unnumbered catalogue. Lorna Simpson. Exh. cat., The Museum of Contemporary Art, Los Angeles, Los Angeles; Miami Art Museum; Whitney Museum of American Art, New York; Kalamazoo Institute of Arts, Kalamazoo; The Gibbes Museum of Art, Charleston. New York: Abrams, in association with the American Federation of Arts, 2006.